Quickly and easily charge two devices from the comfort of your vehicle with our Dual Port Car Charger. The Dual Port Car Charger is compact yet sports a powerful 2.4 Amp port that will Fast Charge your iPhone, Samsung Galaxy device, and even an iPad at the fastest possible speed. One USB port is never enough. 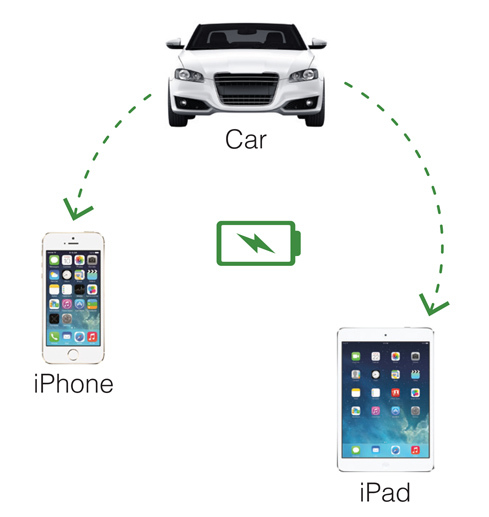 Now you and a passenger can charge your smartphones simultaneously. Or if you prefer, power-up an iPhone via the 1 Amp port and an iPad via the 2.4 Amp port at the same time. The Dual Port USB Car Charger features over-current and circuit protection to ensure that your device is protected at all times while charging.